Blogspiration tag made by BlogQueen. Thank you for translating my originally Dutch tag in English Saranda! These are the questions and rules of the game. Tag five other bloggers to do this ‘Blogspiration Tag’ by answering these same questions in a blog post. I also suggest hitting up your tagged people via social media just to let them know you tagged them to do this tag challenge. Loads of inspiration or do you sometimes have to cope with a writers- / bloggersblock? If the words don’t seem to come out easy, how does that make you feel? How do you stay focused during writing and editing your blog post? Which brainstorm technic makes sure you get enough blog inspiration? Does music also help if you are looking for blog inspiration? Where do the best creative ideas come to life? In which inspiring environment do you like to work? Do you have a ‘Blog Bible’ on your desk for when you happen to run out of ideas? How about other special sources of inspiration? Send me a link to your Blogspiration Tag blog post and I’ll add it to this list (with al the bloggers who did this tag). Wat leuk dat hij er nu ook in het Engels is! Hopelijk krijg je dan nog meer mensen die hem in gaan vullen!!! 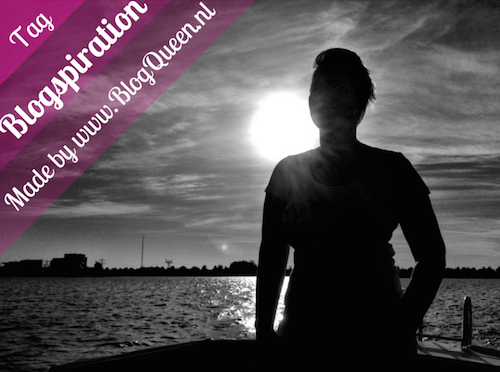 Next story Trends: hoe spot je die voor je blog?